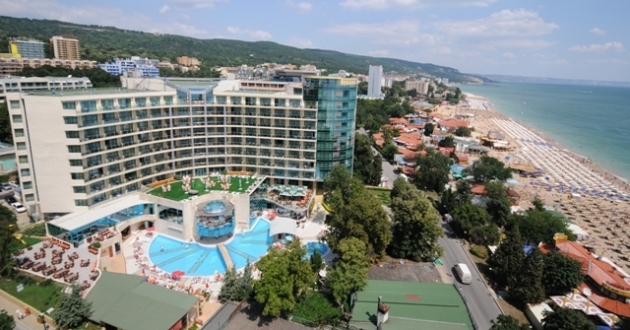 Location: The hotel is situated in the Southern part of Golden Sands Resort, on the first line, near the beach promenade. Accommodation: It consists of 550 beds, 186 double rooms (28 sq.m.) and 48 luxurious suites (80 sq.m.). Most rooms are with sea view. The rooms are equipped with telephone, A/C, TV-set with satellite and cable channels, WC/bath. In the hotel: A restaurant with a terrace, pool-bar, lobby-bar, mezzanine bar, sky-bar, disco, indoor and outdoor swimming pools, childrens pool, fitness and squash rooms, table tennis, SPA center, beauty salon, currency exchange desk, room-service, parking lot, conference hall, Internet room. SPA facilities: classic and exotic and underwater massages, Jacuzzi, solarium, sauna, mud treatments, laser and magnetic therapy, infrared cabin, paraffin treatment. There are large variety of body massages with honey, aroma oils, chocolate, hot stones and several Ayurveda versions for people of all ages. Except for the purely relaxing effect, many of the massages have a major influence in cases of different diseases of locomotive, nervous and cardiovascular systems. SPA Center Marina offers perfect combination of balneological and physiotherapeutic procedures. The curative sea mud, the sea plants and the oil essentials purify from toxins, help losing the weight and restore the equilibrium of the body's liquids and energy. Individual programs of procedures are available at request, leading to improvement of the system's life processes and achieving a perfect build.